Saw this afew times on Facebook and thought i'd share it on my blog! Some interesting things that simply apply to everyday life. Who said stories ffrom the Bible were just stories to read? they are great stories for everyday's lifes lessions and are instructions for living! Click the image to make it bigger to read and see! BTW Do that with any image that is on the site as well! 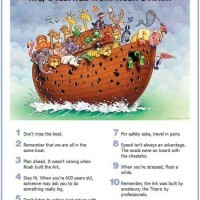 This entry was posted in Images and tagged Life Lessions, Noah's Ark by Tigger. Bookmark the permalink. Good thoughts. Great and fun reminders.